Ches McCartney, The Goat Man, lay fallow in my memory as my own personal property. 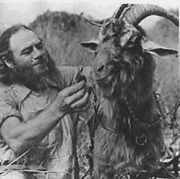 Prone to extravagant thoughts and debatable visions in childhood, I was never quite sure if the Goat Man was real. He seemed real enough with his small junk-laden wagon pulled by goats when he took up temporary residence in an empty lot across from my home in central Florida in 1959. The odor of his clothing was real enough, stringent and potent. The smile that crinkled his eyes under his railroad cap was real enough. I was thirteen, my father had just died, my mother and I were living on the outskirts of poverty, so is it any wonder that I was profoundly moved by the freedom of this wandering Goat Man who spent a lifetime moving on. Forever moving away quickly enough that pain and anguish could not settle around him. I hung out behind a crepe myrtle bush for several days before gathering the nerve to speak to him and learn his secret of how to escape the world. I clutched the last box of Brownie Scout cookies under my arm, a gift, a token of exchange for the Goat Man to tell me his secrets. He refused to accept the gift and insisted upon a barter. The cookies in exchange for a postcard of him traveling down the road. There were other terms too. I had to agree to eat the cookies with him. Was it goat milk that he served with the cookies? I don’t remember. It tasted of garlic and was on the verge of curdling. The cookies were stale but sweet. We sat silent and watched the sun go down behind the centuries old live oak tree that was as gnarled as his hands and as lightning-struck as my heart. The secret is that there is no secret, just keep on moving. Ah, JohnnyCakes, it is so good to see you again. Send me an email with your phone number. Good beginning. You have my interest. Now tell me something about his secret. You must have done more than eat cookies and drank sour goat’s milk.